ROBBIE NEILSON expects Spanish striker Juanma to be an instant success in Scotland should Hearts secure his signature. 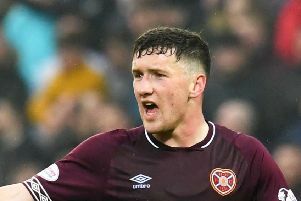 The 24-year-old confirmed yesterday via his Twitter account that he is on his way to Edinburgh to join the Tynecastle club, and Neilson believes he has all the attributes to impress. Hearts have been tracking Juanma – full name Juan Manuel Delgado Lloria – since January. They hope to finalise his capture this week but the matter is complicated given his club in Greece, Kalloni, announced last month that the forward had signed a one-year contract extension. Juanma and his representatives are adamant he is free to leave Kalloni and yesterday he used social media to announce he was flying to Scotland to join Hearts. The Edinburgh club will demand to see official documents to prove his contractual status before offering any deal. Speaking for the first time about the player, head coach Neilson outlined the strength he would add to the forward line. “He’s somebody we would like to get in but there was an issue with his contract in Greece,” he explained. “Obviously that’s been sorted out so it’s something we’ll try to get moving again. We tried to get him a few weeks ago and it fell flat because of the issue with his contract over there. We’ve been waiting to hear back from the agent to find out what the situation is. It appears to be that he’s free. Until we actually see something down in black and white, then I’ll wait and see. “I like him. He’s a very good player and he would definitely cause problems in Scotland. He’s 6ft 2in, he’s strong and he’s a real aerial threat. We identified him in the January window but we couldn’t do anything and ended up bringing Genero Zeefuik in. We went back again and hopefully we can get it done.